← What’s your favourite movie of 2013 (so far)? Cumberbatch fans rejoice! The Sherlock star will star in at least three films playing at this year’s Toronto International Film Festival, including the fest’s opening night gala, The Fifth Estate. For Torontonians and anyone else willing to make the trek to Canada, the Toronto International Film Festival is always one of the year’s biggest film events. And at this morning’s press conference, TIFF CEO Piers Handling and artistic director Cameron Bailey kicked off this year’s festivities by announcing TIFF 2013’s opening film selection, as well as the fest’s galas (red-carpet screenings, often boasting big-name actors and directors) and special presentations. Though more films will be added to TIFF’s roster, this morning’s announcement revealed more than 70 titles, giving festival-goers a good idea of what to expect from TIFF 2013, which runs from September 5-15. The morning began with an early teaser announcement from Bailey via Twitter, where he revealed that Steve McQueen’s 12 Years a Slave will have its world premiere at TIFF 2013. McQueen’s previous films, Shame and Hunger, helped put star Michael Fassbender on the map, and he will once again join with McQueen for 12 Years a Slave, alongside an ensemble cast that includes Chiwetel Ejiofer, Brad Pitt, and Benedict Cumberbatch. The press conference kicked off by announcing a slew of gala presentations, including early Oscar hopefuls like August: Osage County, Rush, and Mandela: Long Walk to Freedom, as well other high-profile premieres, such as The Railway Man (starring Nicole Kidman and Colin Firth), Kill Your Darlings (starring Daniel Radcliffe as Allen Ginsberg), and Parkland (a retelling of what happened at Dallas’ Parkland Hospital on the day JFK was shot, starring Paul Giamatti and Zac Efron) and a few Canadian choices, like The Art of the Steal (starring Jay Baruchel, Matt Dillon, and Kurt Russell), The Grand Seduction (a comedy starring Brendan Gleeson and Taylor Kitsch) and The Right Kind of Wrong (starring Ryan Kwanten and Catherine O’Hara). The long list of special presentations includes world premieres of The Dallas Buyer’s Club (which you may remember as the film that Matthew McConaughey lost a drastic amount of weight for), Atom Egoyan’s Devil’s Knot (the West Memphis Three drama starring Colin Firth, Reece Witherspoon, and Dane DeHaan), Jason Reitman’s Labour Day, Prisoners (Hugh Jackman and Jake Jake Gyllenhaal),The Double (a comedy starring Jesse Eisenberg and Mia Wasikowska), Paul Haggis’ Third Person (starring James Franco, Mila Kunis, and Liam Neeson), and international/North American premieres of Alfonso Cuaron’s hotly anticipated sci-fi offering, Gravity, as well as Joe (David Gordon Green’s second film release of the year, starring Nicholas Cage), Cannes winner Blue is the Warmest Color, Kelly Reichardt’s Night Moves (Jesse Eisenberg, Peter Sarsgaard), Asghar Farhadi’s The Past, and Jim Jarmusch’s Only Lovers Left Alive (Tom Hiddleston and Tilda Swinton). TIFF’s opening and closing night films were also announced. The festival will close with a comedy called A Life of Crime that stars Jennifer Aniston, Tim Robbins, and John Hawkes. 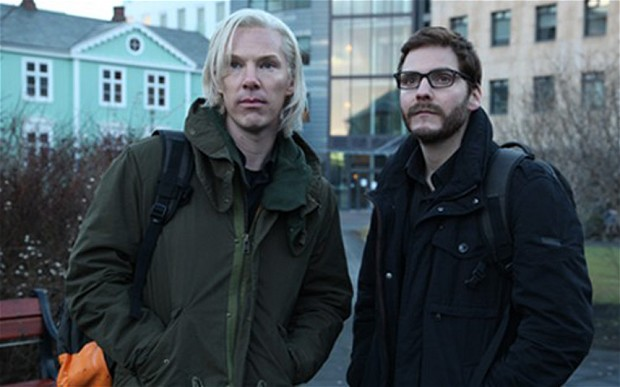 More noteworthy, though, is the choice of opening film, which is the new WikiLeaks biopic, Bill Condon’s The Fifth Estate, which stars Benedict Cumberbatch as Julian Assange. Last year’s choice of Rian Johnson’s Looper as the festival’s opening film marked a shift for the festival, which in the past had always chosen a Canadian film as its opener. The full list of this morning’s announcements can be found at tiff.net. This entry was posted in Festivals, TIFF and tagged 2013 movies, movie news, Movies, The Fifth Estate, TIFF, TIFF 2013. Bookmark the permalink.